Celebrate 25 years of Mega Man with the exciting next chapter in the Mega Man mythology in graphic novel! By popular demand, this latest volume introduces the saga of Blues, aka PROTO MAN! Who is this mysterious robot, and what special connection does he share with Mega Man? Also - Roll may be Mega Man's "little sister," but she's no less heroic! When a cruise liner crashes out at sea and Mega Man isn't around, it's up to Roll to rally the Robot Masters and save the day! Fun, action, adventure and more in this collection! 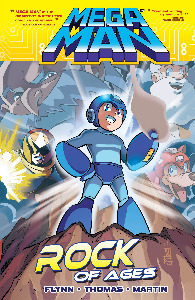 MEGA MAN VOL. 5 collects MEGA MAN #17-20, plus cover art from Eisner-award winning artist Mike Norton!